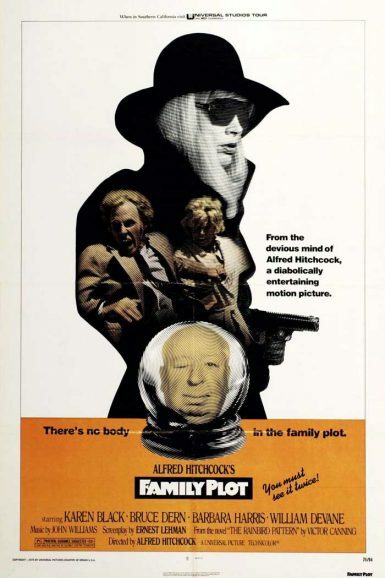 Alfred Hitchcock doesn’t slouch in his last film, Family Plot, about a fake psychic (Barbara Harris) and her cab-driver boyfriend (Bruce Dern) hunting down the long-lost heir to a client’s fortune so they can get a piece of the action themselves. More black comedy than thriller, it turns out the heir is part of a dangerous kidnapping team (Karen Black and New Bev favorite William Devane) and doesn’t want to be found. What follows is a twisted, MacGuffin-laden mystery, deceptive at every turn, which serves as a worthy curtain call for the Master of Suspense. The film was also Hitch’s only collaboration with composer John Williams. 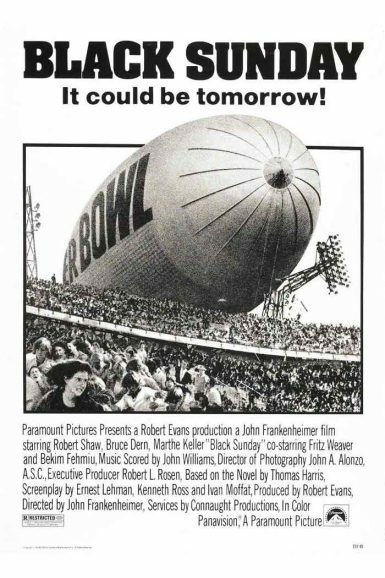 A hot-button thriller ripped from the day’s headlines, Black Sunday takes the high concept of a blimp bombing at the Super Bowl and creates an expansive epic of war, trauma, and revenge. Maj. Kabakov (Robert Shaw) is a hard-edged Israeli commando who tracks Palestinian terrorist operative Dahlia Iyad (Marthe Keller) to America. His investigation leads him to Michael Lander (Bruce Dern), a disturbed Vietnam veteran who’s been recruited by Iyad to carry out the deadly terror attack. A shadow descends on the biggest game of the year, and it’s not just the blimp blocking out the sun. Expertly directed by political thriller maestro John Frankenheimer (The Manchurian Candidate, Seven Days in May). Check out a full set of German lobby cards for Black Sunday on the New Beverly forum.